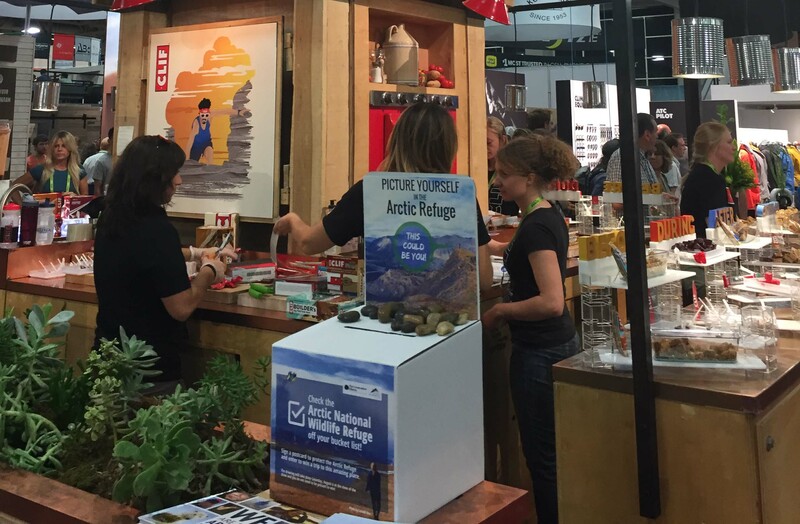 Outdoor Retailers Love the Arctic Refuge! I'm back from an amazing Outdoor Retailer Summer Show in Salt Lake City -- invigorated by everyone's Arctic Refuge passion found throughout the Giant Salt Palace and across the street at KEENfest! The best part of the show was the energy building for the We Are The Arctic Campaign, working side by side with our partners and our combined efforts to protect our Arctic National Wildlife Refuge, located in the northernmost corner of the state of Alaska. Our partner organizations were doing great things at the Outdoor Retailer Show - getting attendees excited about the Arctic Refuge through presentations like OutdoorAfro Rue Mapp's plenary speech about her trip and experience in the Arctic Refuge. And, also like conservation photographer Florian Schulz's presentation, sponsored by Conservation Alliance, that brought the Arctic Refuge to life through both video and photographs - capturing truly wild places and also the essence of the Arctic Refuge. Florian said of a recent trip to Arctic Village, "Why do I do this? For me, it's because my kids will get to see this in the future...My kids were just with me in Arctic Village picking blueberries with the Gwich'in people that live off the land, live off the caribou - it was a very beautiful circle for me, doing this for future generations." And, through the amazing energy of 27 participating partners (check out the ad) that gave away We Are The Arctic books and helped us get thousands of signed postcards asking for the strongest possible protections for the Arctic Refuge. Check out Clif Bar's beautiful postcard collection box that they made for the show. They found rocks to carry on the rocks from the photo of the Arctic Refuge on our box! What's more, KEEN hosted Sutra the motorized polar bear in their outside adult playground also known as KEENfest. Sutra was a super friendly and photogenic Arctic Advocate. 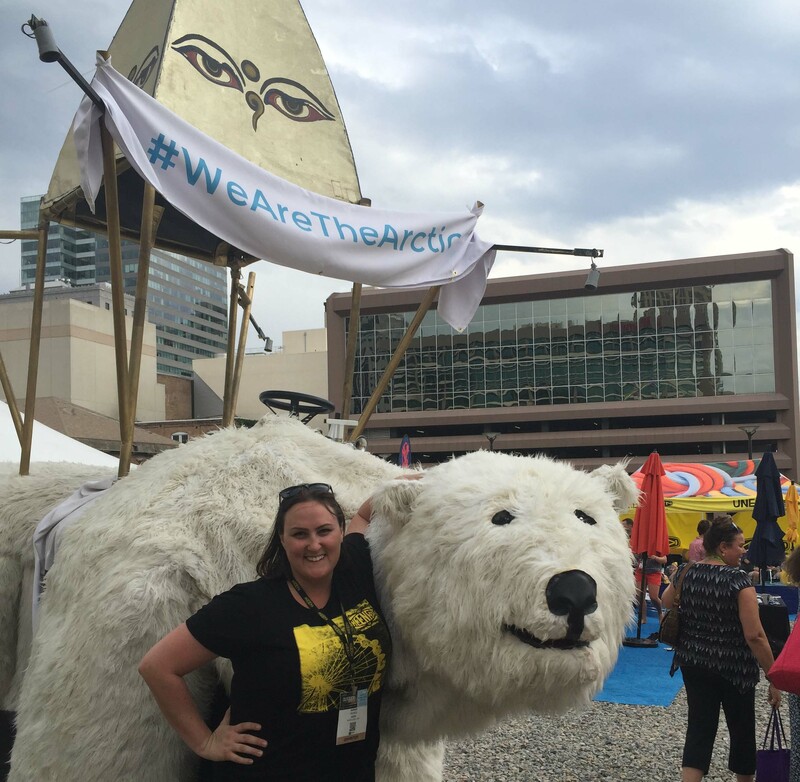 Everyone, young and old climbed on top of Sutra and shared their #WeAretheArctic post! All the KEENfest employees helped us hand out books and encouraged everyone to fill out a postcard to President Obama and to be entered into a sweepstakes for a trip to the Refuge. Drum roll: Sarah Yeakel from Keen was our winner! Congrats to Sarah. More than 4,000 cards were filled out and more than 2,500 books have new homes. Senator Martin Heinrich (D-NM) posed by Sutra proudly wearing his Alaska Wilderness League hat! Truly, the We Are The Arctic Campaign is moving full speed ahead with this momentum gained from our retail partners. While at the show, we also spoke to many retailers about joining our letter to President Obama. More than 100 businesses have signed our letter to the president to say - now is the time to protect the Arctic Refuge once and for all! There are many, many people and organizations that I need to thank for their energy, time and dedication to getting out the word at the show! 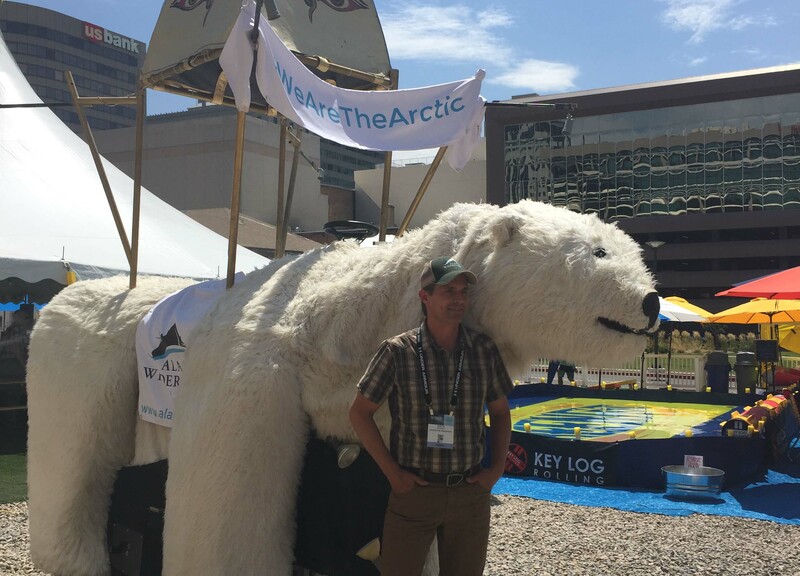 Top of the list is the "Arctic Braintrust" who have been instrumental throughout this multi-year Arctic campaign: Conservation Alliance, Patagonia, KEEN and our very own Board members Gareth Martin and Steve Barker. In fact, check out the amazing thank you video that we shot at the event AND check out our new amazing partner Sutra the polar bear that encouraged folks in in very un-Arctic temperatures to protect the Arctic Refuge!